Third in the Inner Sanctum series has painter Lon Chaney blinded by accident. 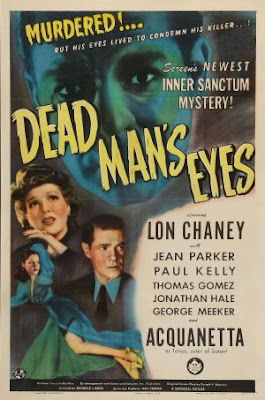 when the benefactor who offered his eyes to Chaney turns up dead he is the prime suspect. Less psychological thriller than all out mystery DEAD MAN'S EYES is an okay thriller. The straightforward approach to the film works against the film as it falls in to well worn means of telling the story. Even the direction by Reginald LeBorg is by rote and the film comes off as just okay. Strangely of the six films in the series this was the only one of the films that I ran into over the last few decades. WHile I knew the other films existed I was hard pressed to run them down even in the collectors market. It wasn't until the films hit DVD and were subsequently put into a rotation on TCM that the other films seemed to screen regularly. I mention this because having seen the film several times in the past I'm forced to wonder if the familiarity interfered with my enjoyment for this review which was done in sequence after seeing the first two films. Ultimately this is a good but unremarkable little thriller.